Landowners pay for the appraisal, the time and expertise of their attorneys and accountants and a title report. 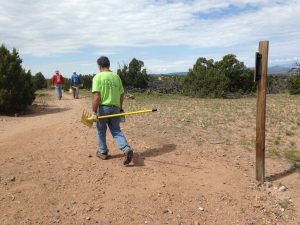 The Santa Fe Conservation Trust incurs significant costs in accepting conservation easements and asks easement donors to help defray those costs. SFCT charges a Conservation Fee and we request a Stewardship Donation. The preparation of the LCIA and Conservation Easement Deed: SFCT staff compile wildlife and vegetation inventories from the Baseline Documentation Report and prepare topographic and aerial maps and photographs of the property. We work with you and your advisors to guide you through the process of protecting your property in perpetuity legally. We help you to create the Conservation Easement Deed and prepare the documentation that you need to complete the NM State LCIA tax credit process and the Federal IRS documentation that you will need to claim your tax deduction. Monitoring the conservation easement: SFCT visits properties under conservation easement at least annually to ensure that the terms of the easement are being met and to document the condition of the property. Legal defense: Part of the endowment will build SFCT’s legal defense capabilities. Over time, there may be violations of the easement restrictions. SFCT needs to be prepared to defend restrictions through litigation if voluntary means fail. SFCT calculates costs to cover perpetual stewardship for each specific property. The Stewardship donation is a suggested charitable donation and is not a prerequisite for acceptance of a conservation easement. However, SFCT must cover these costs before accepting a conservation easement.